(latest IPA file)Since Saurik is yet to deliver, other developers are coming forward and releasing Cydia-less jailbreak tools for the community. 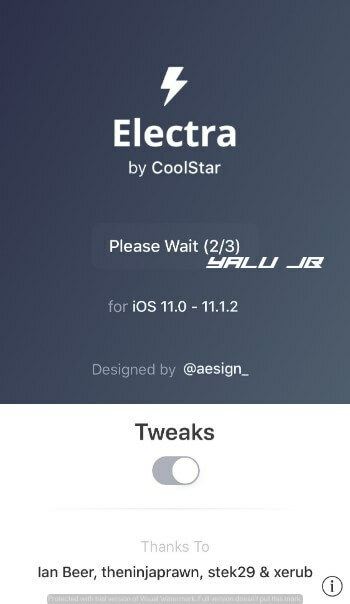 Here’s yet another tool called Electra and how you can install it on your iPhone, iPad, or iPod touch. 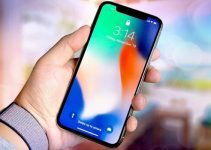 Which device/firmware does Electra support? 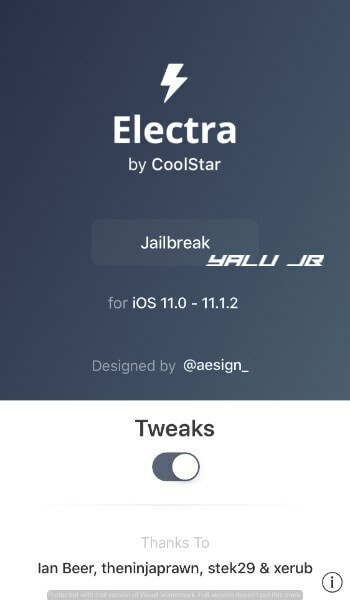 Electra is a jailbreak toolkit designed for tweak developers to test tweaks and themes. It is developed by tweak developer Coolstar and designed by Alessandro Chiarlitti. This developer toolkit utilizes Ian Beer’s kernel exploit, Xerub’s libjb library, AMFI patch by George Dan. It allows users to run tweaks using Comex’s Substitute, which is an alternative to Saurik’s Substrate. Anemone theming engine – You can run Anemone themes if you have the theme files. Substitute – Substitute is a Substrate alternative and you can run tweaks using it. Remember, it does not install Cydia even though it allows you install and run tweaks. Preference Loader – It’s an important Debian package. Dropbear SSH client – Dropbear allows full SSH access without installing any other package. SCP/SFTP/Command line – This tool gives you command line and full access to all associated commands. Warning – It is aimed specifically at developers and is a prelude to the upcoming iOS 11 jailbreak. DO NOT install this toolkit if you are not a developer. 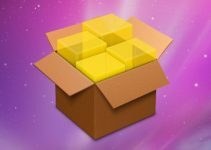 Just like other recent tools, this development toolkit also works with all firmware versions ranging from iOS 11.0-11.1.2. You can use it on all 64-bit devices provided you have the requisite firmware version. December 27 – Version 1.1.0-2 adds a missing file that was supposed to be present for iOS 11.0-11.1.2 users. December 26 – Version 1.1.0 improves stability, replaces Cydia with Sileo package manager, and updates APT and dpkg packages automatically. February 12 – Beta 11-3 fixes a race condition with “jailbreakd” daemon to improve success rate. February 10 – Beta 11-2 fixes improves “jailbreakd” daemon and increases the success rate of jailbreak. February 9 – Beta 11 adds improvements for the “jailbreakd” daemon among a few other fixes. February 1 – Beta 10 is out. It fixes codesigned versions and cleans up the code. January 27 – Beta 9 is out. It fixes the delay users experience while launching apps. If you want to update to beta 9 or above from beta 8-2 or lower versions, you must reinstall all tweaks and themes. January 26 – Beta 8-2 fixes issues with Safari and Chrome, calls and app not working. January 26 – Beta 8 comes with a lot of Sandbox patches and mitigations. Apps will now take longer to launch after a re-jailbreak due to Sandboxing issues. January 22 – Beta 7 is out. It cleans up and repatches AMFID and adds a 3D Touch for quick access. January 21 – Beta 6-5 fixes an issue with launchd daemon. January 20 – Beta 6-4 comes with a lot of new patches and makes re-jailbreaking faster. January 19 – Beta 6-3 adds the “jailbreakd” daemon as a “launchd” service. January 18 – Beta 6-2 is a minor update and fixes issues with the entitlement injector. January 17 – Beta 6 is out. It fixes issues with daemons and the zombie process problem. January 15 – Beta 5 is out. It fixes Substitute and issues with the “jailbreakd” daemon. January 14 – Beta 4 and 4-2 are out now. They contain fixes for AMFI, an issue with a symlink, and better support for Substrate tweaks. January 14 – Beta 3-2 and beta 3-3 are out. It fixes crashes present in beta 3. If you own a plus model, stay with beta 3-2 only. January 14 – Beta 3 is having issues right now. Stick to beta 2 until further update. January 14 – Beta 3 is out now. It can now set boot nonce in NVRAM, adds support for SHA1 binaries, some performance improvements and a faster re-jailbreak process. Step 1 Start Cydia Impactor sideload tool. If you don’t have it on your computer, you can grab it from this link. Step 2 Download the latest beta IPA file using the link above. Step 3 Drag this file onto Cydia Impactor’s window to install it. Step 4 Enter your Apple ID username and password. Step 5 Wait for Impactor to sideload the app onto your iOS device. Once it is present on your home screen, simply open the Settings app and go to General > Profiles & Device Management. Step 6 Verify the jailbreak application present under your Apple ID email. Step 7 Once the app is verified, you can run it without getting the “certificate” error. Tap the Jailbreak button and wait for it to put to put your device in jailbreak mode. Step 8 Wait for it to inject the exploit on your Apple device. Step 9 It will now display a confirmation message (Already Jailbroken) on your screen. Be sure to enable the “Tweaks” toggle to ensure tweaks run properly on your device. This will prepare your device for Anemone theming and customization. You can read the following tutorial for installing Anemone themes on your device. Electra jailbreak uses Anemone theming engine. Therefore, you must use Anemone-compatible themes only. Before you move onto the tutorial, ensure you themes files are present on your computer. Dropbear SSH client is available on ports 22 and 2222. Springboard crashes will result in a respring to Substrate Safe Mode. Sign your binaries with Jonathan Levin’s jtool or ldid2. Executable files must have the necessary root entitlements before you run them. Transfer Cydia tweaks to this location – /bootstrap/Library/SBInject. Transfer Anemone themes to this location – /bootstrap/Library/Themes. Binaries and libraries must be stored in this location – /bootstrap/usr/. You can uninstall Electra with the script available at /bootstrap/unjailbreak.sh. Ensure you reboot your device before you install beta 2 over beta 1. You need to transfer all themes and tweak files manually. A lock backup or copy of the tweaks and themes is imperative. If you run into some issues while playing around with this tool, just leave a comment below. For more jailbreak releases and downloads, follow and like us on Facebook and Twitter. Just downloaded the new v1.1.0 latest IPA file for iPhone X on ios 11.1.2 from Coolstar but, When jailbreaking it get to 2/3 then put me in openSSH running state. Do u know why this is happening? I was experiencing the same issue, unfortunately. You can fix this by switching to unc0ver jailbreak as I did. Naw I’ll just wait for a fix I’ma stick with Coolstar Thanks for the help. You must create a new app-specific password and use that in Impactor. I have jailbroken my device from a long time, but with Electra Jailbreak I have some issues on my iPhone X, almost always at night it froze and then it just crash and restarts by itself, I don’t know why because I have also an iPhone 6s also jailbroken with same tweaks and works fine. Which beta are you using? 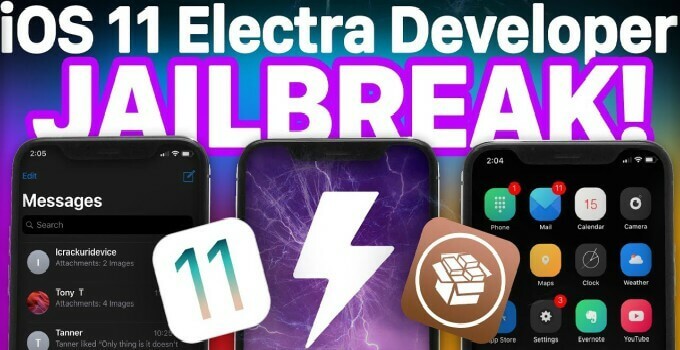 if you are on beta 11, go back to beta 9.
how do you update the Electra jailbreak?? Delete the older file and sideload the new one and run it. After following the steps, my iPhone 6 is stuck on the respring loading logo, I can reboot but it fails every time I retry jailbreaking with tweaks on, I have not installed any other tweak and I already tried uninstalling electra with ‘bash unjailbreak.sh’ and start all over but to no avail. So now we don’t need to install cydia substrate ? In earlier versions, Substrate was a necessity so I installed it. You can now install and try tweaks without it. 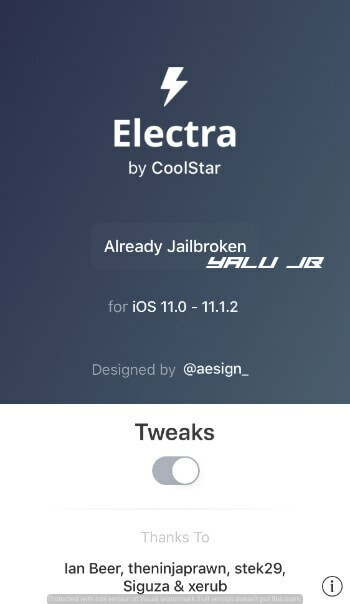 please how do you update the Electra jailbreak? how do you go from version 6 to 7? ty friend! Delete the current version from your home screen and install the new version. This has nothing to do with this jailbreak but I’m out of options and I’m looking to this fine community for help. I have a iPad 1 iOS 5.1.1 and I’m trying to jailbreak. I have found links to for reds now and absinthe but having no luck trying to do the process. If fails with both programs I have also tried downloading from various sources. I’m thinking maybe the are all old links because the jailbreaks did take place in 2012. I’m using a MacBook Air please if anyone has links that they know to be good and valid resources to date please provide. Thank you all. The links are still good but you need to use an older version of iTunes.